Compatible with VPASP V7 only. If you've got VPASP V7, and want to send bulk-emails, then you need to have this facility. 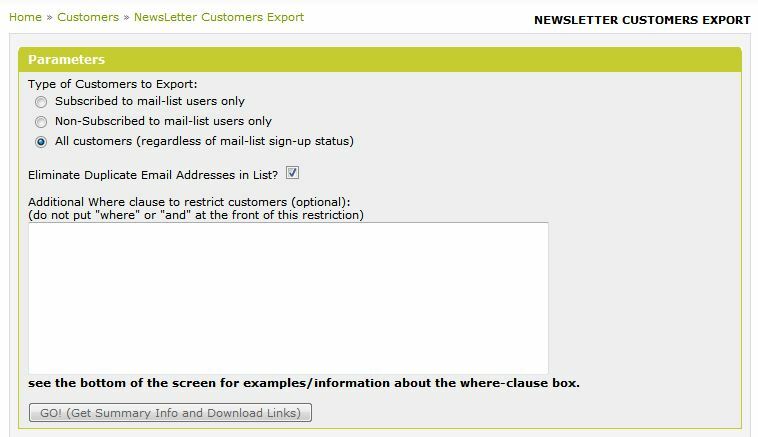 VPASP V7 actually has 2 tables to hold mail-list customers (the customers table, and the newsletter table), so if you use the generic vpasp export facility to export one of those but not the other then you'll miss people out, and if you export both then you'll get duplicates. Even if you only export one of the tables you can still get duplicates. This addon will go through both tables, and export a unique set of email addresses (with the corresponding first/last names) to an excel file. It also gives you the ability to specify additional criteria (for example, to get lists of customers who've bought certain products) so that you can generate a newsletter customer list excel file for a specific target audience. This is currently only available for VPASP V7, but if you'd like it for older versions of VPASP then please let us know and we'll make it compatible with older versions if there's a demand for it. 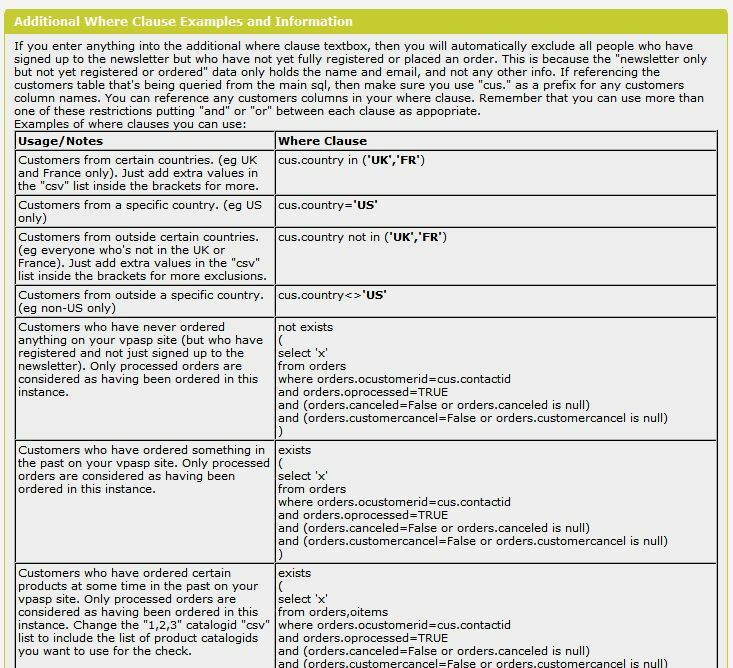 Comes with example "where clauses" on the screen to show you the kind of syntax you can use when specifying optional additional criteria. Please note, this exports the relevant customer/mail-list email addresses, first and last names into an excel file, but it does NOT have functionality to actually create/send emails; it's assumed that you'd use the exported excel file that this module generates and import that excel file into your own mail-shot software. The sql needed to pull out these lists is a lot more complex than it looks at first glance; take a look at The Results/Summary Block sample which shows you the actual query needed for this example and you'll realise that it's not a simple thing to achieve without this module doing it for you. The actual column headings (and which columns to output) that it outputs to excel are easily changed so you can tweak those headings/columns depending on what your mailshot software expects for its headings etc. 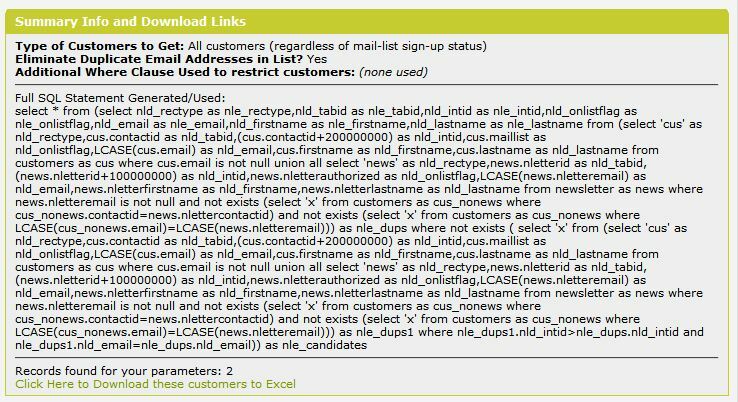 It displays the sql statement used to get the list, so if your mailshot software allows you to specify sql statements (as opposed to just importing a list from an excel file) then you can copy/paste the statement that the Results Block shows into your mail software.